Posh boss Grant McCann (right) is congratulated by staff member David Farrell after the win at Gillingham. Photo: Joe Dent/theposh.com. This was a League One version of a Strictly showdown between Ed Balls and Ann Widdecombe. Victory would go to the least worst rather than the best of the best. My goodness this was a tough watch on a bumpy pitch and in a swirling wind that demanded better techniques than these honest toilers (and the odd disinterested party) could muster. Posh defender Michael Bostwick climbs highest during the 1-0 win at Gillingham. Photo: David Lowndes. Indeed show the first 53 minutes (it was a tortuously long opening half thanks to injuries to both teams and the referee) on a loop at Guantanamo Bay and confessions would soon be flowing. This was football waterboarding, right up until a 90th-minute thunderbolt from the blue prompted a few late re-writes and put smiles on a few faces. Most noticably on Peterborough United goal-scorer Junior Morias and his manager Grant McCann. One of whom is still pinching himself at getting paid to perform at this level, while the other finally found some relief at the end of the week when he’s probably felt like a human punchbag. There was some irony in a 1-0 away win a few days after an assistant manager was booted out of the club partly for apparently suggesting such victories should be a priority. Lee Glover protested his innocence at that particular claim, but he’s a good enough bloke to be pleased both for Morias, a striker he’s spent a lot of time with on the training field, and for McCann, who remains a good mate. McCann was honest enough to admit this was a dreadfully poor spectacle, but when these games are won, the three points remain in the memory longer than the performance, especially as the only previous Football League win on this ground had arrived in 1991. Posh substitute Junior Morias has just let fly to win the game at Gillingham. Photo: Joe Dent/theposh.com. For that McCann will thanks Morias whose stunning 25 yard smack at goal somehow found its way past the huge frame of debutant Gillingham goalkeeper Tomas Moly when there was no time for a response from a team now deep in the relgation mire. That’s four goals for Morias since his January transfer from St Albans. This mini-Adebayo Akinfenwa has scored them all off the bench, although he was on the pitch from the 20th minute at the Priestfield Stadium, and must be pushing top scorer Tom Nichols - an early hip injury victim here - for his starting place soon. Morias was largely anonymous in Gillingham, but he’s a hustling, bustling, little wrecking ball with a cannon in his boots. Apart from a couple of set-pieces from Marcus Maddison, a terrific long-range strike from Chris Forrester which was finger-tipped to safety by Moly, and Craig Mackail-Smith heading over the bar from close range following fine work from substitute Paul Taylor and Michael Smith, Posh rarely looked like scoring. Posh striker Junior Morias on the burst for Posh at Gillingham. Photo: Joe Dent/theposh.com. But the Gills are in freefall. 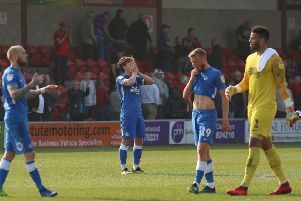 Last season’s club hero Bradley Dack’s decline is far more severe than the one Posh skipper Chris Forrester is currently suffering and their sole attacking tactic here appeared to be hurling long throws into the Posh penalty area. A couple caused alarm, but most were ably dealt with by Posh central defenders Michael Bostwick and Jack Baldwin. So much so that Luke McGee’s first save of the afternoon was to grab a feeble header from Cody McDonald in the 61st minute, five minutes before Posh won their first corner. Posh did emerge from that quite dreadful first period to become the better team. The positive substitution of Taylor for young Leo Da Silva Lopes helped as did the willingness of both full-backs - Jerome Binnom-Williams was recalled - to get forward more readily. Posh were still far from fluent, but the half-time bar was set so low improvement was virtually guaranteed. When the Gills did reach the edge of the Posh area, Bostwick and Baldwin were happy to throw themselves in the way of shots. It was a day for defenders, even though Morias will be the man getting all the attention for a game-deciding moment of magic. Posh: Luke McGee, Michael Smith, Jerome Binnom-Williams, Jack Baldwin, Michael Bostwick, Anthony Grant, Chris Forrester, Leo Da Silva Lopes (sub Paul Taylor, 57 mins), Marcus Maddison, Craig Mackail-Smith (sub Andrew Hughes, 90 mins), Tom Nichols (sub Junior Morias, 20 mins). Unused substitutes: Andrea Borg, Brad Inman, Mark Tyler, Callum Chettle. Gillingham: Tomas Holy, Max Ehmer, Deji Oshilaja, Ollie Muldoon, Lee Martin, Mark Byrne, Josh Wright, Scott Wagstaff (sub Ryan Jackson, 30 mins), Rory Donnelly (sub Harry Cornick, 46 mins), Bradley Dack, Cody McDonald (sub Josh Parker, 74 mins). Unused substitutes: Stuart Nelson, Jake Hessenthaler, Elliott List, Emmanuel Osadebe. Goal: Posh - Morias (90 mins). Referee: Brendan Malone 6 (sub Christopher Wade, 6).